We’ve all been through the joys of packing for a trip. And, with airlines charging a pretty penny for checked baggage it is valuable to know how to pack as efficiently as possible. Here are some simple hacks to help you with your next trip. Untangling a necklace is a true test of patience. Especially after spending a full day traveling. The straw prevents the necklace running through it from becoming tangled. Thus, leaving more time for the trip and less time untangling. You never have to worry about your shoes mucking up your favorite shirt. Place your shoes inside of a shower cap. It’s that simple. No more marks on your clean clothes. Now you don’t have to worry about your hairpins littering the bottom of your suitcase. Sure, you could put them in a plastic bag but there is a good chance they’ll poke through. This is even nifty when you’re not packing for a trip. Never reach into your toiletries bag and cut yourself again. A simple clip over the head of the razor prevents that from happening. Plus, you can have a clip ready on those business meetings. Reduce, reuse, recycle. You can follow that by sticking your cotton swabs into a used medicine bottle. And, it is durable enough stick into a shoe to save some place in your suitcase. When a thief goes through your stuff they will be looking for valuables…not a ChapStick container. So, fill up a tube with rolled up cash or anything else that is small enough to fit. Untangling things does not need to be a part of your vacation or return from it. By rolling up your chargers or earbuds into an eyeglass case you can avoid the tangle. Plus, you can slide this into your carry-on and have it readily available on the plane. No one wants to open their suitcase to clothes doused in shampoo. A cap is great for prevent leaks but isn’t the best when it comes to luggage being pressed up against other luggage. The plastic is an extra safe-guard to keeping your clothing shampoo-free. The best way to save space in your suitcase is to roll your clothing. In addition to saving space, you are also keeping wrinkles away. Placing it into a bag helps with wrinkles as well as keeping them clean. When you pack your luggage your clothes are (probably) clean. It is the trip home when things may get a little smelly. 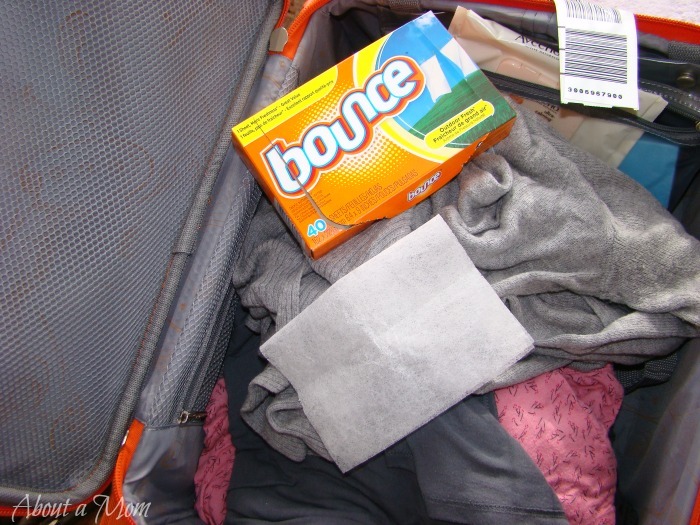 If you don’t have time to wash clothes on your trip home, throw a dryer sheet into the suitcase to maintain a fresh smell. Or, if you really like the smell of dryer sheets then you can pack one up when you first pack. Here’s a two-in-one hack. You not only keep your collars shape but your get to save space. This is one thing I wish I would have known a few months ago. This is something I don’t have to worry about. But, it is helpful for those who do. This is especially helpful for shorter trips where you don’t need more than a contact case worth of concealer. Speaking of things I don’t have to worry about…By placing a cotton ball or pad into your foundation it prevents cracks and breakage. It also helps keep the inside of your compact clean. This is a clever way to keep your earrings together. Running them through buttons will make it easier to throw them into your carry-on without too much. This works great with any kind of earring: hoops, studs, or ones that hang down.